Although I'm only an occasional participant in Sky Watch Friday, last night, Megan, Weston, and I walked through the neighborhood, and I carried my point and shoot Panasonic LZ-8. I couldn't help but think last night's sky would be perfect for Sky Watch Friday. Welcome SkyWatchers, welcome regular readers, sit back, relax, and enjoy the sunset. And after you've done that, you might enjoy viewing more of my images in a larger former. Please visit TA Photography. This one was certainly worth posting! Beautiful! How odd to hear you greet us out loud! Thanks Mary, and to everyone else That isn't my real voice. It is a STAR TREK thing I did last night. See the post below. Tom: It is a wonderful show for SWF for sure. Thanks for sharing. I added a crossed squirrel and a link to you. I do hope you got some visits. Wow thats a fantastic photo Tom, love all the colors through the tree. Fantistic sunset. You have a great blog. Beyootiful colors! 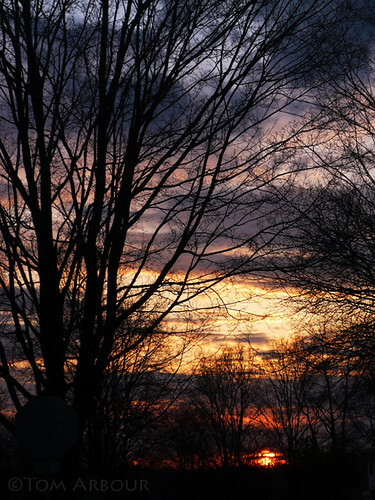 I love the sunset through the branches, really nice shot! Great colors on the sky, nicely composed too. Happy SWF! Interesting colors in your evening sky. My skywatch photo is on my Brookville Daily Photo blog. A marvelous sunset! I love seeing it through the tree branches. A beautiful capture of the sunset..great entry! You were right, definitely SkyWatch worthy! ;) Gorgeous Ohio sky. You are right. It is perfect. All of those beautiful layers of colour. It would be cool to see this photo again but when the tree leafs out, just for contrast and comparison. Beautiful photo,I love the trees inthe foreground, they realy enhance the sky. Glad you captured this one before the leaves returned. BEAUTIFUL capture! I can't wait to come to Ohio for a visit and take some evening walks with my dad!